By Craig | February 5, 2019 | This post may contain affiliate links, which means we may receive a small commission, at no cost to you, if you make a purchase through a link. Read our Disclosure. 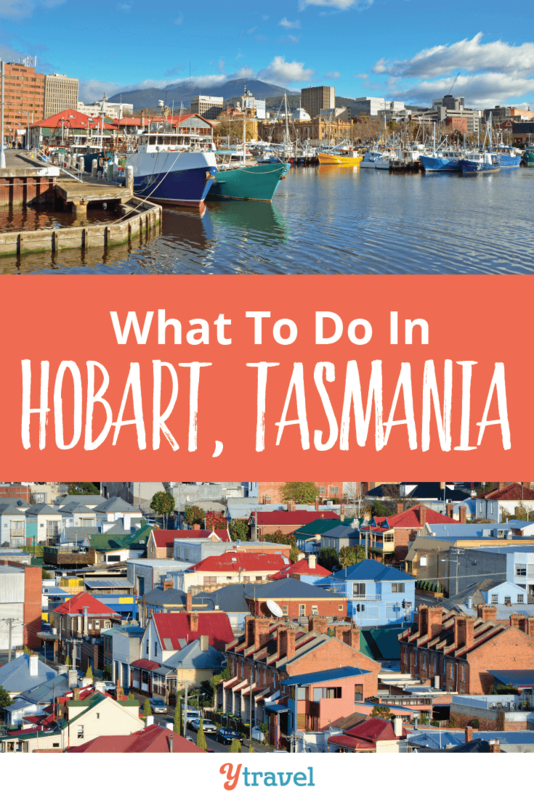 Wondering what to do in Hobart? We spent 6 days in Hobart, Australia’s second-oldest city, and loved our time there. It’s not the biggest of cities by Australian standards, but there are enough things to do in Hobart to warrant several days visit. 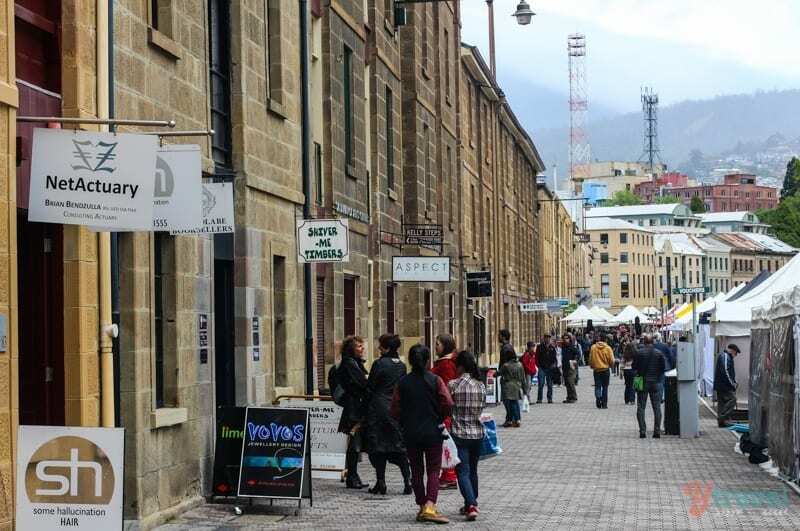 I love walkable cities centered around a harbour with historic neighbourhoods, historic buildings and a good local vibe – Hobart delivers on all fronts. Throw in fresh seafood, famous markets and being within easy reach of other awesome destinations for day trips, Hobart rocks. My favourite area was definitely Salamanca with the historic sandstone buildings converted into restaurants, cafes, bars and specialty shops and opposite the tree-lined park offering shade for the infamous Saturday Salamanca Markets. 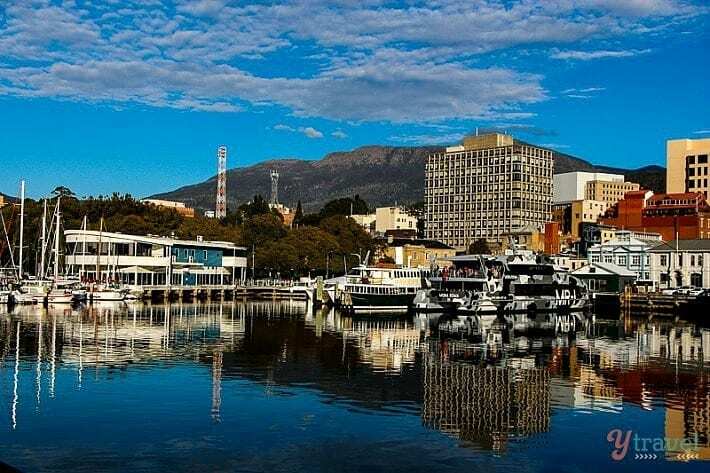 Below are our highlights on what to do in Hobart for first-time visitors, as well as where to eat and sleep in Hobart. MONA – the Museum of Old and New Art has been billed as the place that revitalized Hobart and put it on the must-see destination list of Tasmania. The founder describes the MONA museum as a “subversive adult Disneyland.” It’s an interesting and fun art gallery and we like how you’re a part of the experience as you move through it. We wrote about our MONA experience here. Historic Hobart Harbour – Not a large or busy harbour, unless you’re in town early January as this is where the famous Sydney to Hobart yacht race ends. But it’s a beautiful harbour to wander and so serene early in the morning on a clear day. 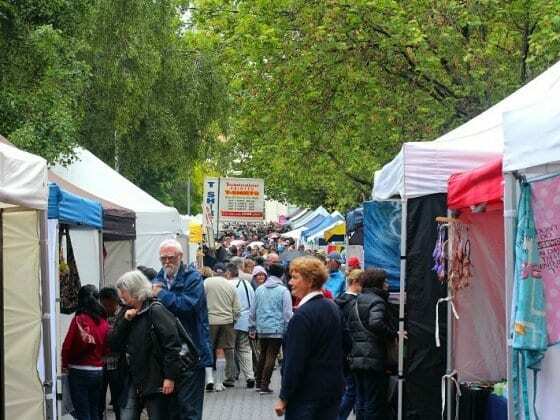 Salamanca Markets – the infamous Saturday Salamanca Markets have the reputation as one of Australia’s best markets, and if you can time your trip to take it in. Set in picturesque Salamanca Place, it’s essentially one long street of vendors selling their wares, buskers performing and yummy street food. Salamanca Place – Wandering Salamanca Place and Salamanca square with the historic Georgian sandstone warehouses and eating and drinking in the cafes and pubs is a must do. Historical Battery Point – known as one of Hobart’s more prestigious suburbs, it adjoins Salamanca and has a large number of historic houses. We loved wandering this suburb and admire the prestigious homes and the rose gardens. It also has a nice playground for the kids and local cafes to enjoy. Female Factory – The Cascades Female Factory is the only Australian Convict World Heritage property that shares the female story of transportation. Her story is a two person dramatization of sharing the life of a typical female convict. It gave a fantastic insight into this harsh existence. Make sure you do the heritage walk (guided tour) of the site. Cascade Brewery – Enjoy a visit to Australia’s oldest brewery and sample a great range of beers, and cider, in a lovely terrace setting. Take in the history yourself, take a brewery tour and learn about the brewing process, or take a heritage tour around the 3 acres of gardens which also includes tastings and is suitable for families. Mt. Wellington – Often referred to as ‘the Mountain’ by the residents of Hobart, it rises to 1,271 metres over Hobart’s harbour and the wide Derwent River. If you’re lucky enough to get a clear day, we didn’t, I’ve been told the 21kilometre drive to the summit ends with panoramic views of Hobart, Bruny Island and the Tasman Peninsula, with Bushwalking and barbecue and picnic facilities. Tasmanian Museum and Art Gallery – This gallery has recently undergone a huge renovation and celebrates Tasmania’s history, art and culture. A highlight was the Tasmanian Aboriginal Gallery which celebrates Tasmania’s indigenous history and culture. 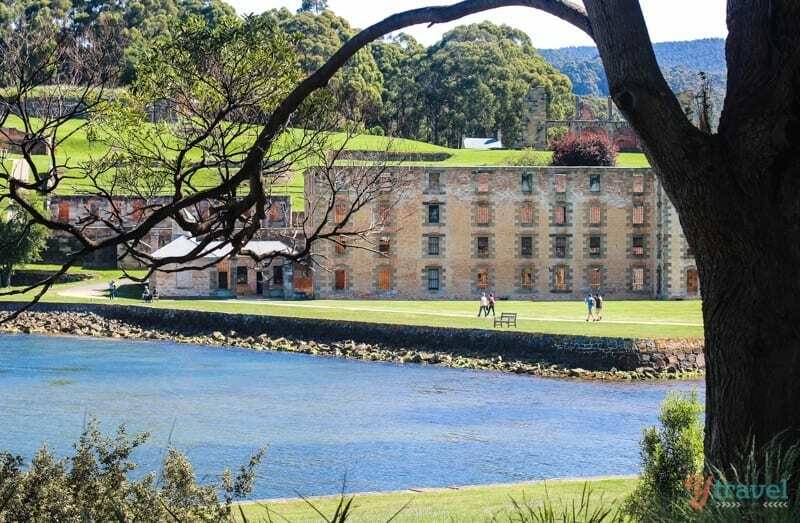 Port Arthur Historical Site – one of the most fascinating, moving and interesting places to visit in Tasmania. Port Arthur has a violent and troubled history as a penal colony for some of Australia’s hardened convicts, yet it’s beauty brings this contrasting sense of peace and happiness. Don’t miss the ghost tour. 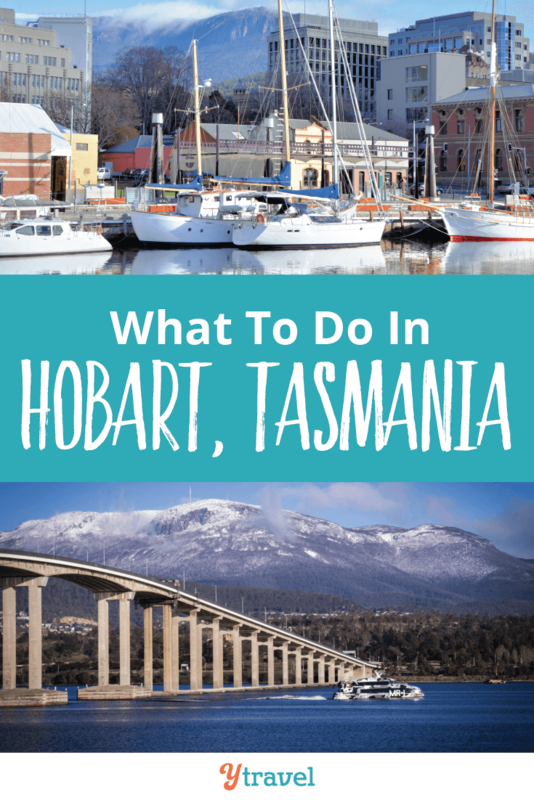 Get there via a public bus from Hobart to Port operated by Tassie Link. Bruny Island Cruise – One of our favourite experiences in Tasmania. 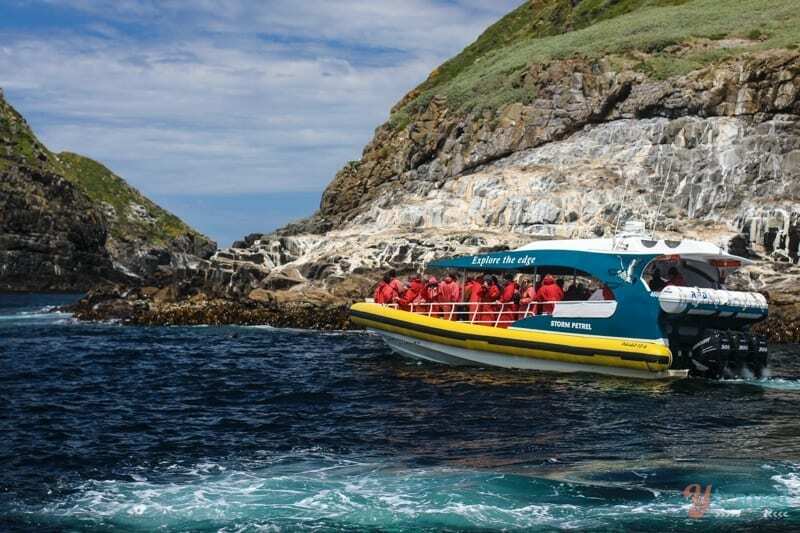 This award winning wilderness cruise takes you along the rugged coastline of Bruny Island where you can see dramatic cliffs, sea caves, and wildlife life seals, dolphins, seabirds and if you’re timing is right, migrating whales. The Full Day Tour from Hobart includes a scenic bus tour, ferry crossing to Bruny Island, morning tea, 3 hour wilderness cruise and lunch. Richmond – 25 km north-east of Hobart is the town of Richmond. 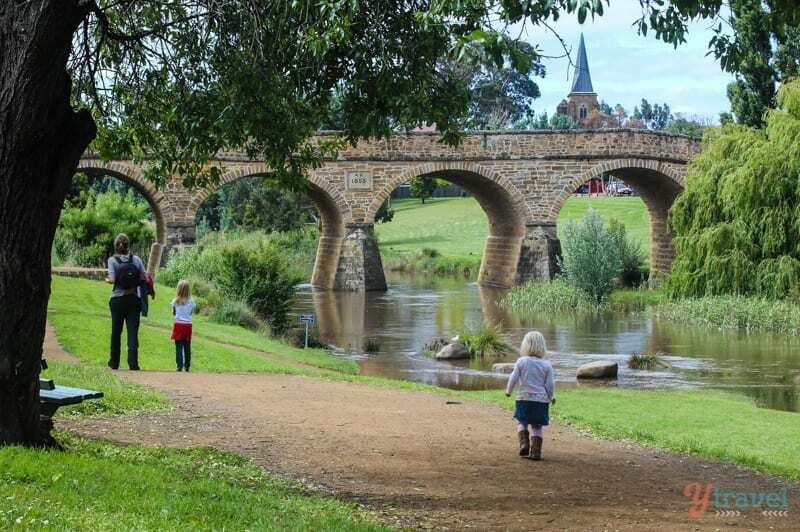 Step back in time and walk across Australia’s oldest bridge, stroll along the picturesque river, visit galleries, antique shops and have lunch at the Richmond Hotel or Bakery Cafe. Richmond makes for a great place to wander. Daci & Daci Bakers – this place is an institution in Hobart. Expect a line up out the door, especially at lunch time or if a cruise ship is in port. There are trays of gourmet pies, baguettes, pastries, salads and a range of excellent breads. 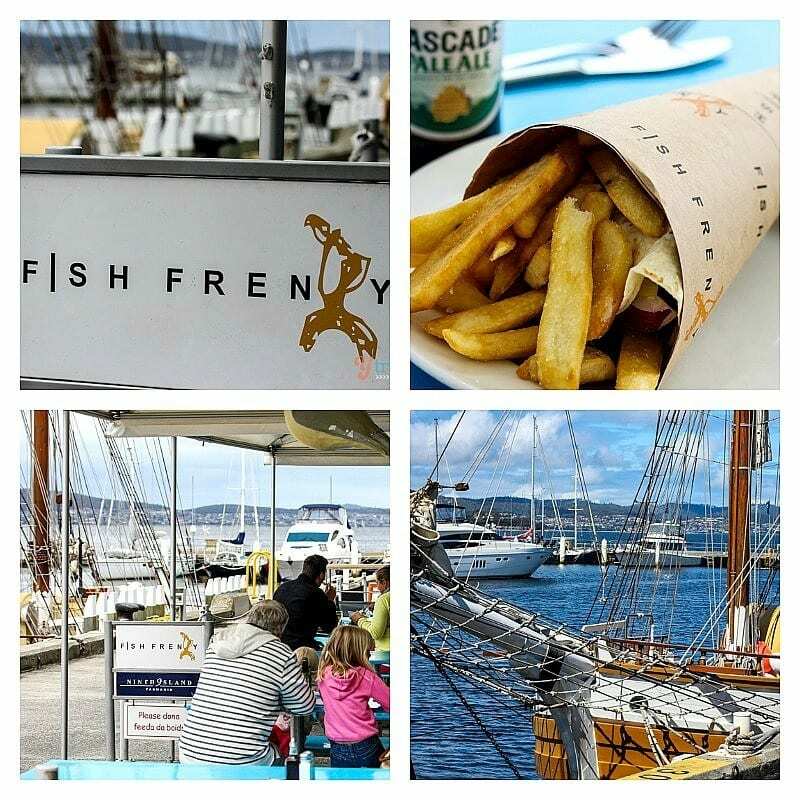 Fish Frenzy – besides the fresh fish and chips, grilled seafood, salads and seafood chowder, a highlight is the location right on Hobart waterfront. Sit outside in the sun and watch the sailboats. Another cool feature is having fish & chips in a cone. 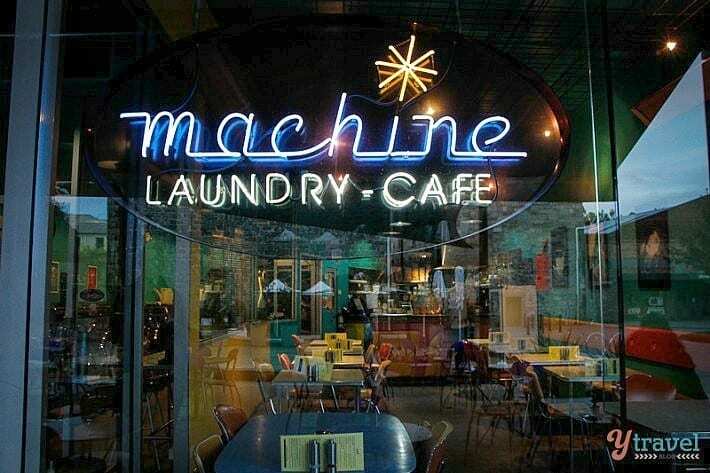 Machine Laundry Cafe – a popular place with locals and visitors, this funky operating laundrette is a great place for breakfast or lunch, with great coffee and the biggest muffins I have ever seen. And the large alfresco area overlooking Salamanca Square was great for us with kids. 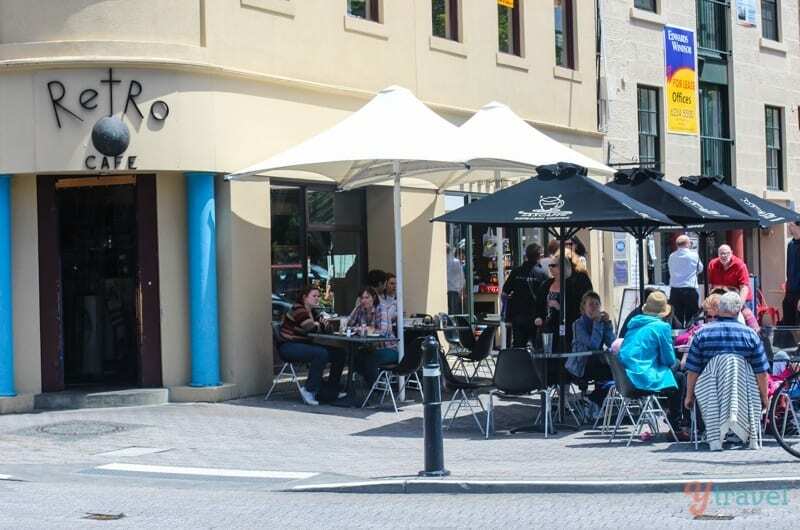 Retro Cafe – another nice place for breakfast or lunch with a great location in Salamanca Place. Enjoy a bite to eat on the footpath and watch the world go by. 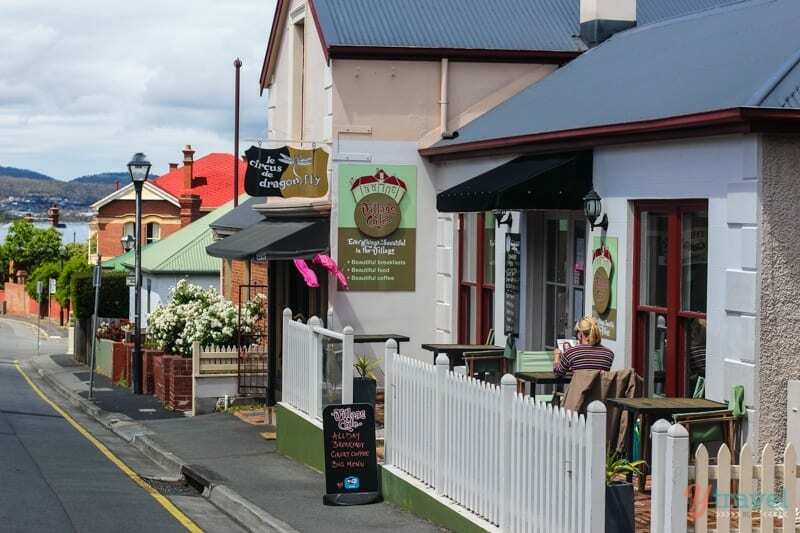 Tasman Quartermasters – our local friend in Hobart recommended this burger restaurant – wine bar – cafe. Try a unique Tassie specialty in the Wallaby burger washed down with a craft brew. Good menu, value for money and gluten free options are a bonus. The setting is relaxed and entertaining as well. 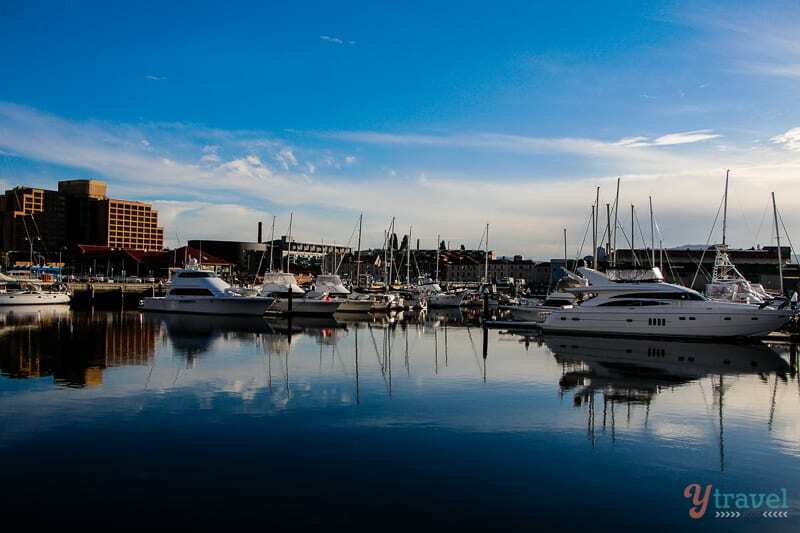 Henry James Art Hotel – go here for fine dining on Hobart’s waterfront. This is Australia’s first dedicated art hotel with the site dating back to 1804. Cargo Bar – is a wood-fired pizza and wine bar. How could you not love having a coconut and honey mojito in a 180 year old sandstone building? YHA Hostel – smack bang in the centre of Hobart with an easy walk to everything in the city and waterfront, the YHA is your best budget option. Clean, comfortable and with a variety of room options. We stayed there in a family room with private ensuite and were very comfortable. 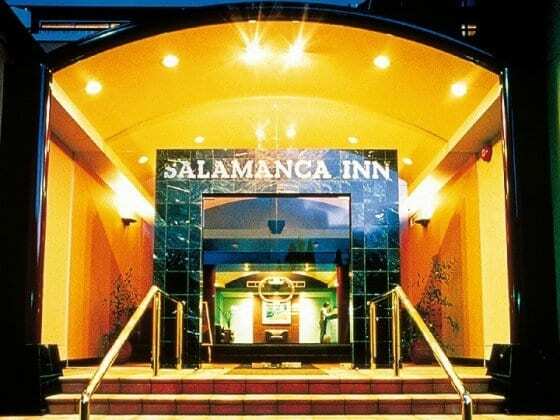 Salamanca Inn – excellent mid-level accommodation in a perfect location. 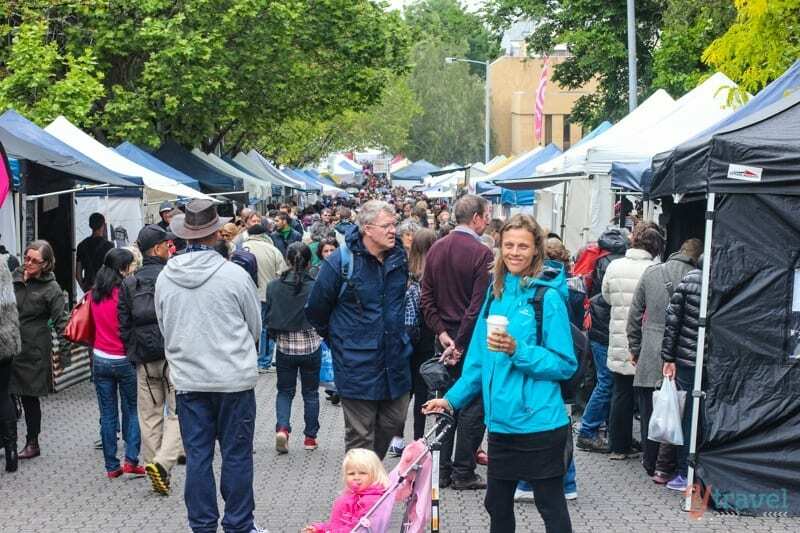 Stumble 50m to Salamanca Place and enjoy the markets and everything on offer, and walk to the best Hobart has to offer. This all suite hotel with self-contained apartments was great for us as a family. Booking.com has over 150 properties in Hobart including hotels, apartments and hostels. You get free cancellation on most rooms and a best price guarantee. Check out these awesome tours of Hobart with our partner Viator. Can you offer tips on what to do in Hobart?Please share in the comments your things to do in Hobart. Great post guys and perfect timing since we’ll be heading down to Tassie in Feb! Thanks for the tips and hopefully we’ll have more to share on here when we get back. I’m yet to visit Hobart. If I ever get a chance to visit Australia, I am sure to visit Tasmania, and I am going to use your guide. I have bookmarked this page. Thanks. Good to hear Renuka. I’m sure you would enjoy visiting Tasmania. My trip to the Salamanca Markets has been a memorable one. I was particularly drawn by its woodwork, ceramics and glassware. Among the cuisines both me and my partner gorged on gourmet pies and wine. We had visited Garagistes twice during our visit there! 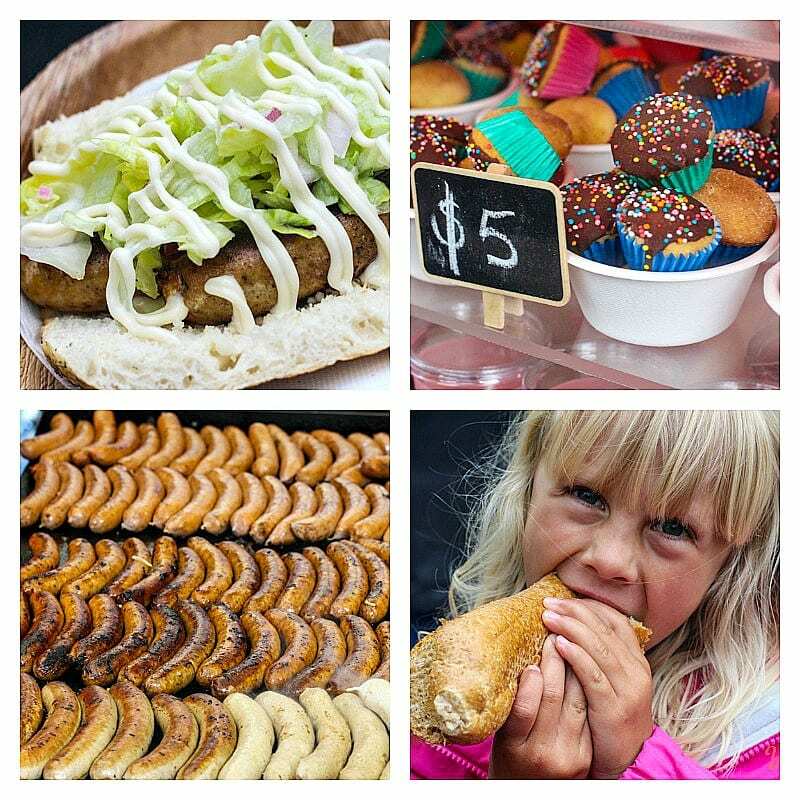 It’s a great market Sussan. You’re making me hungry again!! When I think of Tasmania I always tend to think about the wild nature but I had no idea of what Hobart could look like. Seems like a very pleasant and peaceful city, and Buny Island looks amazing. Thanks for sharing! It is a pleasant city Julien. And Bruny island is spectacular. Really enjoyed that cruise. A bit of a day trip but… when on the way to visit Port Arthur years ago I did a magnificent horse ride on the Tasman Peninsula, just a couple of hours roaming free and fast on a beautiful horse with a great guide…. next time I visit will try to do that again. Gorgeous! That sounds awesome Seanna. We love horse riding. Many years ago, the casino was big news in Hobart so it’s great to see so many different things to do now. MONA has been on my list of things to do for a while now so I really must get organised and visit Hobart again! A great list that seems very well researched. We are planning to go to Hobart for Christmas this year so all of this looks like fun 🙂 We’ll have to bookmark this page. A nice what to do list in Hobart. I should never skiped Tasmania on my travels down under. Maybe next time. You could incorporate a trip to Port Arthur with the Tasman Island one. Great post thanks! 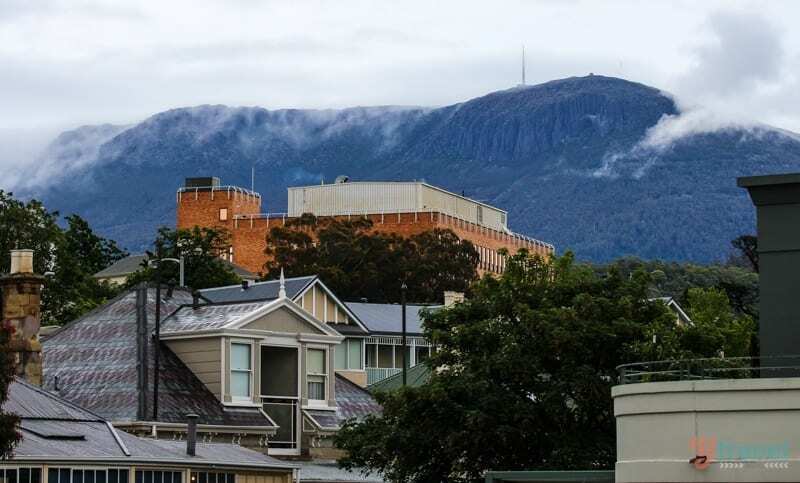 I love hobart…. one of my favourite places to visit. Boating there must be absolutely amazing there, the landscape and pictures speak for them self’s. Thank you and love your sharing for the Hobart and Bruny Island experiences. Two question: We are taking the 11am – 3 hours curise, do we have sufficient times to drive from Hobart into the Island and catch the 11am cruise? And we do get sea sick and it has been years since we lasted took a ferry, we intend to take the sea sick tablet but will it make us sleepy and does it really work? I think if you leave early enough you’d make it. There can be a bit of traffic getting in for the ferry so give yourself some time. I can’t remember how long it takes to drive. Google it to see, but be warned, it seems like driving times in Tasmania are short, but they always take much longer than you anticipate. In regards to the sea sickness, I can’t say for sure as it does depend on the conditions for the day and how badly you are affected. It can be bumpy out there. They do give you ginger tablets on the boat. It also gets cold on the boat, so rug up. Parking infringement issued while getting voucher! As a recently arrived tourist I parked and went to the voucher machine only to find the antiquated device only worked with coins! I thought all payment devices these days handled plastic! All parking meters where I come from do, ie Brisbane! I went to get change, apparently a common request that is routinely rejected! After trying a number of business I managed to change a $5 and purchased a voucher but when I returned to the car there was an infringement notice issued one minute after I parked! This is purely revenue grabbing where the attendant waits till you leave your car the issues an infringement! I will be placing this notice on all the tourist sites to warn visitors about the Hobart City Council’s revenue grab by issuing parking infringement notices as soon as you leave your car and the use of antique voucher machines that only work with coins! Parking infringements are a nightmare. I understand your frustration. I hope your fine wasn’t too heavy. We recently received a fine in Mobile, Alabama. It was our fault we weren’t paying attention to the sign. As soon as we saw it on the car we freaked out as we’re used to ridiculously high parking infringement fees in Australia. IT was only $10!! We couldn’t believe it. I feel your pain. If you contact them and share your story they may let you off it this time. Your story sounds reasonable to me for them to justify letting you off it. Really looking forward to my upcoming trip to Hobart. Thanks for the helpful suggestions. We’ve been debating what to do and see outside of the city and it sounds like the Bruny Island Cruise is a great option. Is that essentially a half day or full day excursion?